For most new direct selling representatives their biggest fear is: How do I keep my business going after I run out of family and friends? That’s a great question. A great question that very few know the answer to. Why? Because very few direct selling companies are run by people whose livelihood depended on the answer to that question. When you are looking for a direct selling company to join we encourage you to look for results. The product can be great, the people can be great, the web site can be great but in the end if you are not making the income you desire then what does it matter? The Style Dots co-founders are “from the field.” We know what it’s like to have your income dependent upon your commission check. So, when we built Style Dots we literally built the company of our dreams. A company that we ourselves would want to be representatives. We are just over one-year-old and we already have Boutique Partners that have reached the top of our compensation plan. Which means it works! We give free items even when it’s a single order you have made at a coffee shop. 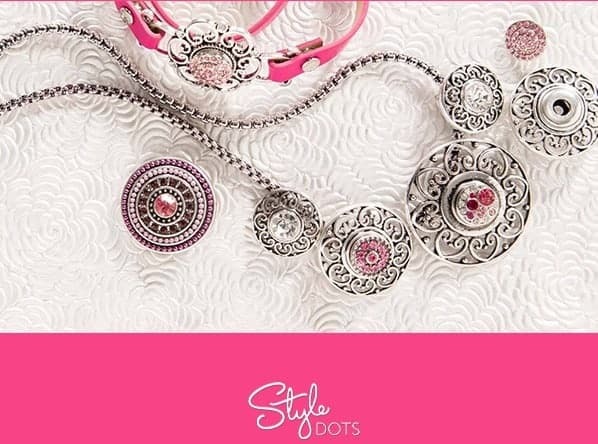 Our high-quality interchangeable snap jewelry is made with a .990 deep silver not a .925 silver. Your rank and commission checks are not dependent upon your team members reaching their rank level. Before you join another direct selling company contact us for a comparison. We believe you will be pleasantly surprised. “Direct to corporate” positions are still available for those with proven leadership experience.